This large format book presents poem and photographs by Leslie Scalapino, and "works on paper, painting on found materials" by Marina Adams. Each page is a sheet of card folded back on itself into the spine, so the book has a white "inside" not entirely visible. The photographs are of monks at the Sera Monastery in Tibet, a formal debate represented as a series of stills showing the physical bodies participating. The poem and the photographs are side by side on that which Elizabeth Frost calls a "dialogic page whose field is a fluctuating photo-text". Scalapino's poem is itself a debate, repeating itself, returning to the word 'social', to roses, a mountain, black dawn, 'night', ground, the 'military wolves'. The Tango is an unravelling/strangling knot. Scalapino notes, "Placing one's mind–actions beside magnolias (words). The same figure repeated everywhere, a line or passage may recur exactly as slipping out of, returning to, slipping out of, a frame of concentration and sound." Proposition, statement, question, ellipsis – the poem "twists and terms" (as a reviewer on Amazon put it). How is the mind affected with ideas? The pink roses are not the pink sun. The pink sun is rising. Sera, in Tibetan, apparently means 'Wild Rose Garden', as the monastery was once surrounded by wild rose woods. But are the roses of the name now interior, "are 'social'" merely? Scalapino's "frame" is full of patch laid on patch. army to retrieve them for burial. The work and its debates are imbued with the atmosphere of this social image, sanctioned corpses. What violence, which military? Is this remembered? How death is initiated, how it is 'accepted'. 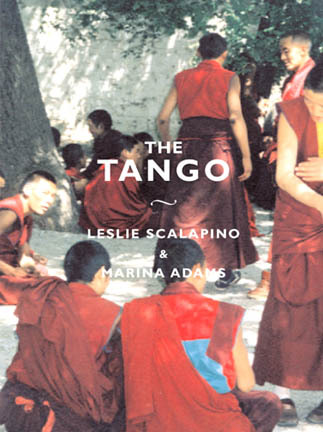 The photographs give off a hundred shades of red from the monks' robes in the dappled shade. It is a crowd speaking; there is no visible hierarchy. This interest in flat surface runs through much of Scalapino's thought, "The way of making something flat, flattening it out, would be to raise it up" she says in an interview. This flat is also a ground, a common ground of seeing, how the mind is decompressed over flat space. Exterior phenomena fanned through language which adapts itself as formations are displaced, new forms are found. As Layman P'ang (740-808) wrote, "The conditioned, and named forms / All are flowers in the sky." Historical time, the 'social', suggests a ground, but one which must be flattened, "In fact, one may go even further" wrote Benjamin in 'The Storyteller', "and raise the question whether historiography does not constitute the common ground of all forms of epic. Then written history would be in the same relationship to the epic forms as white light is to the colours of the spectrum." In The Tango, the white light of the social as the mind wakes to its own forms of seeing. Benjamin's "slow piling one on top of another of thin, transparent layers". The eye seeing its own light. How does 'the tango' relate to the monks and to this text of violence and repetitions, and how do these relate to Marina Adams' dots and over–layings? There could be many answers and I've already said enough to suggest several. The tango of interior debate and exterior phenomena; the tango of the dialogic photo-text. But there is a strangeness here, encounters and mixtures held into the claustrophobic effect of circling repetitions, cut through with parentheses and bounded with other materials. It reads as a self-reflexive text which takes its own absorption and blows it up into an intricate held explosion of details. 13" x 9 3/4"; 28 pp, 39 color & 23 b/w images. ISBN: 1-887123-41-5. $29.95. Granary Books.